Ronald Addison of Libby, MT designed the winning entry for the 2019 Sasquatch hunting stamp contest. Titled "Catchya Later", Ronald's entry pays homage to the elusivity and longevity of the Sasquatch. 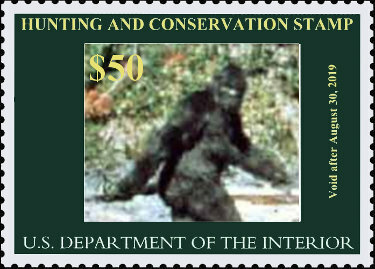 The National Sasquatch committee of the U.S. Department of Interior voted to hold the $50 stamp price this year, but some members voiced concerns of needing additional funds to offset expected migratory support needed to aid sasquatch returning from their winter habitats in Mexico. Hunting enthusiasts should expect an increase in next year's fees. The stamp itself does not provide a person the legal opportunity to hunt Sasquatch. It is given to all participants in the national sasquatch lottery whether they are selected for a hunt or not. The cost to enter the lottery is the face value of the stamp - in 2019 that is $50.